This article takes a deep dive into the design decisions at the heart of the Clash Royale economy. The elegant solutions in this game make it an excellent case study. Clash Royale is one of the most influential mobile games of the past two years. For many developers this game has been a go-to source for inspiration and solutions. The number of recent mobile games that make use of at least one trendy game mechanic “proven” by Clash Royale is staggering. Large scale adaptions are also common. We have seen the core economy of Clash Royale almost entirely replicated in dozens of free-to-play games. I recently took the balancing of Clash Royale for a spin to see how this economy is designed. The aspect of maintenance and game evolution was of particular interest. I have listed four of the key takeaways below. The spreadsheet used in the process is attached at the end of the post. So let’s have a look at how Clash Royale is balanced! The primary measure of progress in Clash Royale is trophies. Trophies are the metric used for ranking and matchmaking players. They also gate features and content. Certain trophy thresholds unlock different arenas, which in turn unlock new cards and increase the income for cards and coins. The game initially launched with six different arenas, not counting the Training Camp introductory arena. Over time the number of arenas has grown to twelve. What the designers want to avoid here is having to balance each arena individually. To get an insight on how this Clash Royale avoids this problem, let’s first look at the unlock schedule of cards. Most arenas unlock six new cards: two commons, two rares and two epics. The symmetry is not perfect, and the last arenas and legendary cards behave differently. You can still clearly see the intent. Balancing the income of different rarities is much easier if there is little to no variation in the ratios of unlocked cards to account for. Cards are distributed randomly via the chest system and we can see that the loot pools grows with each new arena. Does this mean that it makes sense for a player that plays with Arena 1 cards to intentionally stay in, or even drop down to, Arena 1? Ie. does the game reward you for playing in a way that conflicts with the motivation of winning matches and climbing the rankings? No. This might sound sensible if the total amount of cards per chests was fixed. In Clash Royale the amount of cards per chest also increase with each arena. The amount of cards in chests is tuned to be proportional to the amount of non-legendary cards unlocked in that arena. For example the Golden Chest contains ~0.6 cards per unlocked card in any of the arenas. As a result the expected income for any early game card remains roughly the same regardless of the arena. The progression pace is the same for all of the many chests in the game. For example, the Magical Chest has exactly three times as much cards and gold as a Golden Chest, and the Giant Chest has eight times the contents of the Golden Chest. Overall the late game arenas behave very similarly to the early arenas. They just have a lot more stuff. All cards in Clash Royale can be upgraded to increase their stats. In a PvP game this can create a balancing challenge. It would be very complicated for the designers to have to think about stat balance of the cards separately for low levels and high levels. The impact of introducing new cards to such an environment would be hard to control and content expansions could turn out to be very disruptive. The solution in Clash Royale is pretty foolproof. All card level ups (with a few exceptions) increase the hit points and damage output of the card by 10 percent. As a result the interactions between two cards are the same at levels n vs i as they are at levels n+x vs i+x. The simplicity in the unit balancing is made possible by two perfectly scaling primary stats: hit points and damage. Equal percentage changes in both values cancel each other out. A different core gameplay with different core stats may lead to much more complexity when it comes to balancing the stat progression. Now different rarities do have different maximum levels: A common card can be upgraded to level 13, but a legendary only to level 5. The 10 percent rule still applies to all cards. You can think of all cards in terms of common card levels. In this case a legendary card comes out of the box “already leveled” to level 9. At level 2 it is equivalent of a level 10 common card. We have established that upgrading a common card by one step has the same effect as leveling up a legendary card one step. What about the cost to do so? Here again cards of different rarities are treated almost equally, as can be seen in the table below. The costs to max out any rarity card at equivalent common levels are for the most part exactly the same. For instance the cost to upgrade any card to its maximum level is 100,000 gold. 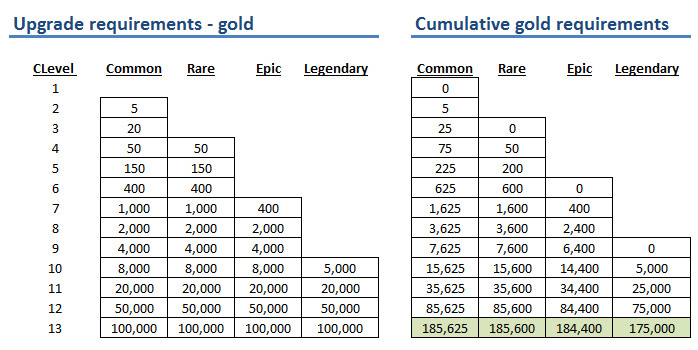 Likewise the total gold cost to max out any card is almost equal: around 185,000 gold. Upgrading a card requires not only gold but also duplicates of the card. The biggest difference between the rarities is the number of card duplicates needed for upgrades and, well, their rarities. To max out any common card, the player needs 9,587 instances of that card. For rare cards this number is 2,587, for epic cards 387 and for legendary cards 37. For the player to be able to upgrade common cards and epic cards at the same pace, the game would have to reward them with one epic for every 24.8 common cards. Is this the case? No. The ratio of epics in chests varies from around 1 in 500 to 1 in 30, depending on the chest type. There are of course a few exceptions such as the Epic Chests and Legendary Chests, which only contain cards of one rarity. However all in all it looks like the higher rarity cards are quite scarce both in absolute and relative terms. Clash Royale has a lot of different reward sources that feed into a progression system deep enough to sustain years of play. How does Supercell make sure that the reward pacing and balancing remain smooth? Let’s have a look at the chest lottery system where most of the income comes from. We already know that the absolute income from chests grows when you move up in the arenas. What about the drop rates that determine how many rare, epic and legendary cards you get? For example the Magical Chest guarantees the player one epic card and six rare cards at Arena 1, but as much as four epics and twenty four rares in Arena 12. Non-guaranteed cards have a chance to be of the higher rarities, and the probabilities change according to chest type and arena. Where do these numbers come from? Are they defined separately for every chest and arena combination? No. For each chest the designers mostly only need to set three “Rarity Factors” and the initial number of card cards for Arena 1. From there onward formulas can take care of the scaling up from arena to arena and the evolving guarantees and probabilities. It is also worth noting that the type of chests that you receive from battles follow a fixed order that currently repeats every 240 chests. This is called the Chest Cycle. Each cycle sums up to 44 days of unlock timers. The card and coin income can be estimated and tuned on a per cycle basis. For instance, let’s assume Supercell sees it necessary to increase the income of legendary cards. One of the many ways they can do this is by changing the chest cycle. They could, for example, introduce a Legendary Chest to the cycle. I found Clash Royale to be an excellent case study for economy design. The game fulfills two important goals that are good to keep in mind for any free-to-play game. The first goal for economy design is to align the intrinsic motivations of players with the extrinsic rewards that the game dishes out. The same goes for the opposite: we want to avoid rewarding any play patterns that are not fun for the player using them or for others. One good example from Clash Royale is trophy dropping, ie. losing on purpose. There are several elements in place to make this behavior less attractive. Second, we want to make sure that balancing is easy to manage with the resources at hand. It is important that the tuning is not fragile and can deliver a good experience in spite of a few off parameters or differing play styles. The balance should also not break with future iterations or content expansions. While you may never get to a perfect balance, one practical way to get close is to make sure the balancing is designer-friendly. Overall Clash Royale achieves both goals very well. Much of this is thanks to design that relies on simplicity and symmetry. With smart design as foundation, the developers are less at risk of getting bogged down by constant parameter tuning or complex simulations. Instead they can focus on pushing the game forward. You can click here to download the spreadsheet I used to examine the CR economy.